We encourage attendance; by following the home inspector around the home, observing and asking questions, you will learn more about your new home as well as obtain an instant evaluation. We provide you with personal attention; by taking the time to explain unfamiliar systems, suggest maintenance procedures, and point out ways to correct problems. We will even provide repair and maintenance hints; and even if requested remodeling advice. We work for you exclusively; and if needed will continue to even aftter you move in by telephone consultation. 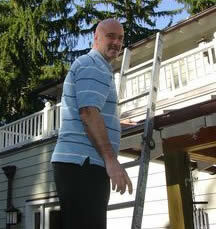 Maintenance Inspection - An independent home inspection ensures all systems are functioning. Radon Testing - Testing is the only method to know your exposure. Infrared (IR) Scanning Service - perform a full scan of the structure in an effort to detect issues that may not be detectable with a standard visual inspection. Structure - The foundation, floors, framework, chimney. This will also include inspector entering the crawlspace, basement and attic when applicable. Electrical - Service line, capacity, main breaker, fuse/breaker box (location and internal condition), sub-panels (location and internal condition), wiring installation, grounding and bonding, operate GFCI/AFCI's, switches and outlets, light fixtures. Plumbing - The condition of water supply and waste removal systems including evidence of leaks and proper venting. All water fixtures and drains will be operated and inspected for proper flow and drainage. Heating - Operational check and visual inspection of the primary heating system. Exterior - Porches, decks, grounds, sidewalks, driveway, windows, grading, doors. Roof - Covering material, gutters, downspouts, flashings, skylights. Interior - Cracks, water stains, fit and operation of windows and doors, level and solid floors and fireplaces. Garage - Doors, automatic door openers including safety sensors, firewalls and fire doors to living space, floors and window.